Key off-road attributes of Toyota's FJ Cruiser, which will be released locally next month, attest to its ability to traverse rugged terrain and deliver full-scale off-road driving performance. 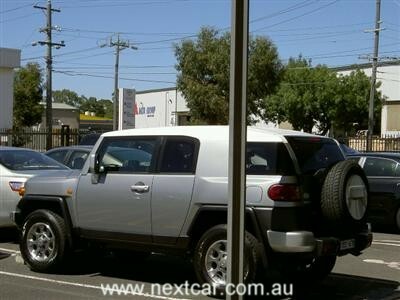 The FJ Cruiser has the best departure and break-over angles in the Toyota 4WD range - 31 and 29 degrees respectively. Its approach angle of 36 degrees is bettered only by the Land Cruiser 70 Series. Larger angles can allow a vehicle to negotiate steeper climbs or descents without having parts of the vehicle body, such as the bumpers, make contact with the ground. The FJ Cruiser also provides excellent ground clearance under the rear differential and vital chassis components - a minimum of 224 mm, second only to the Land Cruiser 200 Series. The adoption of 17-inch wheels and short overhangs - 865 mm at the front and 1,115 mm at the rear - contribute to the FJ Cruiser's off-road prowess. A vehicle's break-over angle is particularly important for off-road transitions from a level area into a descent and from a climb to flat ground. A good departure angle can enable a driver who has overshot a turn-off on a steep, narrow track to return in reverse, rather than doing a three-point turn. Set to join Toyota's local line-up late next month, FJ Cruiser provides basic, capable, affordable, off-road transport for buyers with active lifestyles. The new model is inspired by the original Land Cruiser FJ40, which was known as the vehicle that could travel to, and return from, any extreme environment. The modern day FJ will appeal to serious off-road enthusiasts with its 200 kW, 380 Nm 4.0 litre petrol V6 engine, dual-range transfer case and large wheel articulation. The Toyota FJ Cruiser is fitted with a comprehensive safety package including vehicle stability control, active traction control and anti-skid brakes with brake assist and electronic brake force distribution. Standard equipment also includes six airbags, a reversing camera, rear parking sensors and active head restraints for the front seats. Stay tuned to Next Car for further news on this trendy new model for Australian shores.